Three churches in Indonesia’s second-largest city, Surabaya, were hit in bomb attacks which killed 13 people and injured dozens on 13 May. The bombings are described as the worst terrorist attack in Indonesia since 2005. According to news reports, one family carried out the attack, although the Islamic State (IS, Daesh) has claimed responsibility. It is alleged that the family belonged to an Indonesian IS-inspired network, Jemaah Ansharut Daulah (JAD) and may have spent time with jihadis in Syria. Santa Maria Catholic Church was attacked first by two young men believed to be brothers. The men, 16 year-old Firman Halim lahir and 18 year-old Yusuf Fadhil lahir, reportedly arrived on motorcycles and detonated explosives. 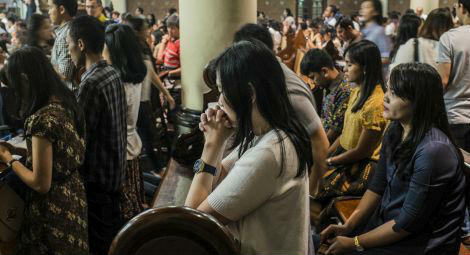 Diponegoro Indonesian Christian Church was attacked by a woman and two girls aged nine and 12. Strapped with bombs, Puji Kuswati Iahir, Fadhila Sari Iahir and Famela Rizqita blew themselves up at the church. They were believed to be the mother and two sisters of the young men who attacked Santa Maria Catholic Church. Dita Oepriarto lahir, a man believed to be the father, drove a car laden with explosives into the grounds of Surabaya Centre Pentecostal Church. The second and third attacks are believed to have happened five minutes apart. A police headquarters in Surabaya was also targeted in a suicide bombing on 14 May. According to news reports, the attack killed four people and injured 10. In recent years Indonesia’s pluralistic tradition of ‘Pancasila’ has come under threat. Despite President Joko Widodo’s attempts to distance the government from radical Islamists and to remove some of the previous government’s apparent complicity with intolerant groups, religious intolerance has risen across the archipelago. CSW’s latest report on freedom of religion or belief (FoRB) in Indonesia, highlights that Christians, Ahmadiyya and Shia Muslims, as well as other religious minorities and moderate Sunni defenders of pluralism are increasingly fearful of the rise of radical Islamism and its influence on politics and society in the country.